Trail #1 (Upper Meadow) - Easiest - Access trail # 1 by using foot bridge near warming station. Allows access to trails #2, #7, and #5 (good for beginners and warming up). Trail #2 - Moderate - Passes water falls and slowly ascends toward the National Forest. Using MULTIPLE USE TRAILS in National Forest allows skiers to access trail. Trail #5 - Moderate - Returns skiers to route 302 just east of upper meadow (gentle hills, good for beginners). Trail #7 - Most Difficult - Accessed from upper meadow or trail #2. Lower #7 good for beginners, upper #7 good for intermediate to expert. Trail #3 - Most Difficult - This backcountry/snowshoe trail leaves from rear parking lot. Follows along brook. At intersection, beginners turn left to access trails #7 & #2, or intermediates turn right to continue along #3, #3A and #3B for rolling hills. Trail #19 - Moderate - At end of #2, turn left toward #5 or right onto #19, follow signs for this wide “out & back” trail. Great for spring skiing. Trail #19A - Moderate/Most Difficult - Connects end of #19 with midsection of #2. Also accesses new trail #19B. Bottom half is steep, top half is not. Trail #19B - Moderate - New switchback trail winds around house-sized boulders, connects #19A with top section of #7. Trail #5A - Moderate - Alternate route to trail #5. More rolling and a little more difficult than trail #5. Trail #22 - Most Difficult - Leaves trail #5 and intersects with trail #5A. Good for intermediate to expert. Trail #6 - Moderate - Leaves lower #5, ascending a gentle hill. Follows a loop & returns to #5. Good for all abilities. Trail #40 (to #41) - Easiest/Moderate/Most Difficult - Pick up trail #40 at top of trail #5 (across from water tank). Follow trail #40 groomed on left side of multiple use trail to a small concrete building. At this point trail #40 leaves multiple use trail. Continue on #40, an extended downhill to Bear Notch Road, where you turn right. Ski up road about 100 yards, cross road and continue down hill across Bartlett Brook. At this point, left follows #40 downhill to railroad tracks, right goes to #41, #42 & #43. Trail #41 - Most Difficult - Varying terrain, with a black diamond downhill. This trail is also used to extend 10km village loop. Trail #42 - Most Difficult - A loop that branches off just beyond #41. Intermediate uphill, follow signs at four-way crossing, intermediate downhill return. Trail #43 - Expert - Leaves #42 at four-way crossing. This trail has a double diamond downhill. Please use caution on this trail. Trail #40 (to Grand Summit Hotel) - Easiest - After crossing route 302, #30 changes to #40. This trail follows along railroad tracks – crossing one road, then leaves tracks and continues past upper #47 and #48. #40 will bring skiers back across railroad tracks to a highway crossing on Route 302. After crossing highway, skiers will be on trail #50. Trails #47 & #48 - Easiest/Moderate - Leave #40 in Grand Summit Hotel area. Upper #47 is intermediate, lower #47 allows beginner access to Grand Summit Hotel, leading to skier access entrance (good place for a bite to eat). Trails #50, #53, #54 & #55 - Easiest - After crossing Route 302, trail #40 changes to #50. Trail #50 leads skiers to Fields of Attitash. All trails in this area are very scenic (beginner). Lower Fields - Easiest - Larger than upper meadow, #12 and #13 leave from here to access upper and lower Saco River trails. Trail #10 - Easiest - Leaves from rear parking lot, follows highway to a safe road crossing, past upper #11 and enters lower field. Trail #11 - Most Difficult - Upper #11 leaves from #10, rolls up and down, over two stream crossings and down a short steep hill (intermediate). Lower #11 may be accessed by trail #12. This trail brings skiers through a pine forest (beginner). Trail #12 - Easiest - Leaves from far left hand side of lower field, crosses railroad, past #17 and leads skier to #16. Turn left on #16 to access upper Saco River frontage, turn right to go directly to scenic views on river bed, continue along #16 to connect to opposite end of #17. Cross tracks again and #13 will bring skiers back to lower field. Trail #13 - Easiest - Leaves from the far right hand side of lower field, offering beginner access to #30. Trail #17 - Easiest - Shortcut across #16, following along a beaver bog. Good area for wildlife tracks. Trail #20 - Easiest - This trail goes through fields and a maple grove, leading skiers to trail #21. Trail #21 - Moderate - This trail leads up a hill of intermediate ability, back down across the railroad tracks and on to trail #30. Trail #30 - Easiest - Follows the lower Saco River frontage, goes around a few houses, and returns to the river. 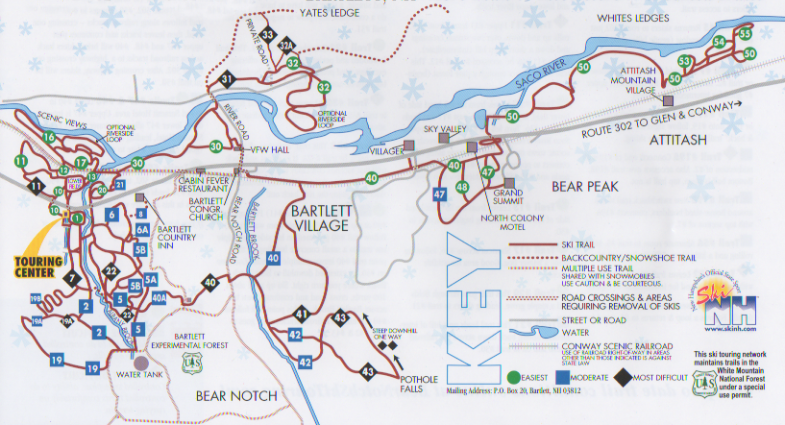 This trail leads skiers to #31 as well as the village of Bartlett and Bear Notch Deli. Trail #31 - Most Difficult - Leaves trail #30 at east end of Saco River frontage. Skiers may cross Saco River on road bridge and continue on trail #31. This area of our trail network is known as the Yates Farm trail network. Trail #31 ascends and descends several hills before winding around several fields. Even though fields are very scenic and simple, a skier will have to have the ability to do a controlled snowplow to negotiate hills on trail #31. Trail #32 - Easiest - Branches off trail #31. This trail is wooded and perimeters the fields, offering excellent wind protection. Good for beginners, but must be accessed through hills on trail #31. Trail #32A - Most Difficult - Leaves trail #33 and returns to trail #32, involving a hill (intermediate and advanced). Trail #33 - Moderate - This trail branches off trail #32, going by trail #32A. It is an out and back trail that ascends constantly to the National Forest boundary. Intermediate and advanced skiers will enjoy the ride back out!